The Royal Irish Academy in conjunction with the American Chamber of Commerce Ireland recognizes and acknowledges exemplary ideas, originating in Irish organizations, making a social and economic impact through research innovation in meeting market needs. These ideas are celebrated each year at the US-Ireland Research Innovation Awards. 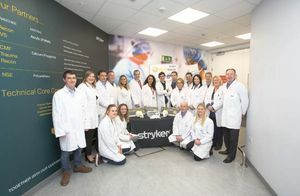 This year, the collaboration between the University of Limerick and our R&D staff’s work on our DirectInject product line was recognized with the Higher Education Institution (HEI) Award. 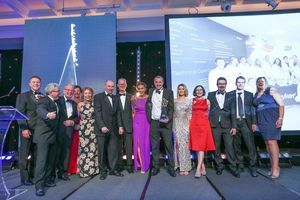 This prestigious Award in the category for research innovation excellence, is presented to Irish institutions with links to the US corporate sector. DirectInject was launched in 2015 after five years of intense research and development by our team. We were able to provide a solution for our customers that is simplified in delivery, however, extremely advanced in its internal engineering complexities. DirectInject answered our customers’ requests for a simplified solution that removes the complexity of bone cement preparation. This prestigious award represents the amount of passion and commitment to excellence that went in to DirectInject. We strive to develop innovative products and services that ultimately improve the lives of patients. The high recognition of DirectInject and our talented team exemplifies our efforts to make a difference in the lives of people around the world through our products and services, and through our employees, each and every day. More details about the US-Ireland Research Innovation Awards 2017 are available here.